First Second Books (Macmillan Children's Books) is coordinating a five day multiple blog celebration of girl power-ness in graphic novels. Thank you First Second for including Kid Lit Frenzy as part of the fabulous Girl Power Graphic Novels Blog Tour. For a complete list of all of the blogs participating, click here. To celebrate Girl Power in Graphic Novels, I asked Mairghread Scott (The City on the Other Side) a few questions. Thanks Mairghread for stopping by Kid Lit Frenzy. Other than reading the comics in the Sunday paper when I was a kid, I was a late comer to the world of comics. However, from what I have seen and read, the profession is dominated by men. Over the past decade, more and more women writers and illustrators are making their presence known. How have you seen the world of comics change from when you were a child to the present day as a creator of comics for both adults and children? Things have changed dramatically! I remember being followed around by clerks when I went to comic stores because they were so surprised a woman was buying comics let alone wanted to make them. There still aren’t many women writing and drawing comics, but it is changing. Pioneers like Gail Simone, Devin Grayson and others helped many young women see that success is possible. 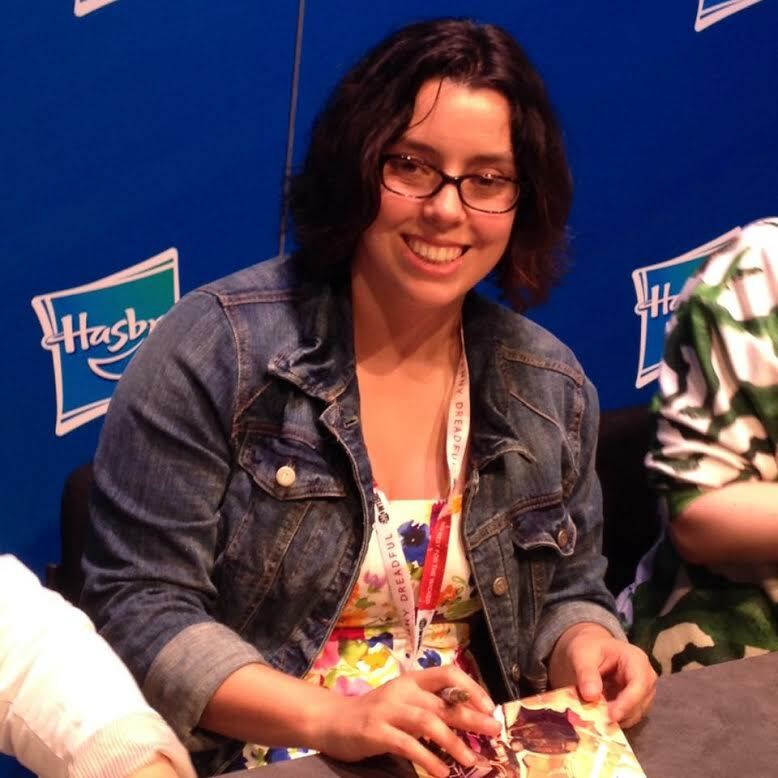 In fact, the most successful creator today is Raina Telgemeier, by a mile! Each woman that succeeds in comics pushes us all a little bit forward and each girl that reads comics, any comics, proves we’re a market worth pursuing. Writing comics that fall within a specific world canon (Marvel, DC, etc) must be very different from creating an original story. Your new book with First Second, The City on the Other Side, seems to be very different from your other work. What drew you to this story and was there a specific reason that you chose to set it in the early 1900's? Will this be the first in a series of books? The City on the Other Side is a lot younger than my other comics work, but my day job is writing cartoons so it’s a bit more in line with that. For people that don’t know: City is the story of Isabel, a young hispanic girl who falls into the fairy side of our world and discovers the fairies of San Francisco are in the midst of a civil war. Isabel gets a magic necklace she believes will end that war and has to journey to the city to do just that! I’ve always loved the “little kid on an epic adventure” story and San Francisco has always been a really magical place to me because I was born there but left before I could remember it. When I learned about the Great Quake of 1906 it felt like such an epic disaster that it seemed like the natural start for Isabel’s story, or at least, for our fairy civil war to begin. As far as more books, City is a complete story but we definitely left the door open if there’s interest. I’d love for Isabel and the gang to go on more adventures. If you were to give advice to young girls wanting to enter the world of comics as a writer or illustrator, what would you recommend to them? When in doubt, speak up! It’s almost always the answer. Don’t know how to break in? Ask at a con. Don’t know who to send a submission to? Ask the publisher. Not sure what your editor’s note means? Say so. Think you’re gonna miss your deadline? Tell someone! Every problem I’ve had on a project could have been solved (or at least made better) if someone spoke up. It can be very scary to say you don’t know how to do something or you’re not going to be able to, but everyone in this business has been there at some point. Speak up, show up and keep trying. You’ll make it. About the author: Mairghread Scott is an animation and comic book writer. Her published books include Marvel Universe Guardians of the Galaxy, Transformers: Till All Are One, Transformers: Windblade, Wonder Woman 75th Anniversary Special #1, and Science Comics: Robots & Drones. Her latest graphic novel is the fantasy adventure The City on the Other Side.